We were fortunate to find Tally-Ho in Ft. Lauderdale in December, 2009 after looking for 5 years. 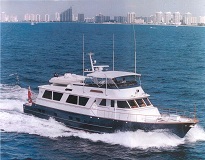 She is a navy blue hulled 1988 Burger, 81′ Gentleman’s Motor Yacht. 3 state rooms + 2 crew quarters. After interviewing for a few days we hired Scott & Cassandra to be our Captain/1st Mate. Very excited to start our trip. We spent Christmas in Tryon while they provisioned the boat for us. This entry was posted on Thursday, April 29th, 2010 at 18:02 and is filed under Uncategorized. You can follow any responses to this entry through the RSS 2.0 feed. You can leave a response, or trackback from your own site.